SOA consultant Todd Biske, who did a great job on a panel I was honored to moderate earlier this week, has some good thoughts on the definitions and roles of IT categories and SOA. His blog posting on "acronym soup" is worth a read. And thanks to the other members of "The Future of SOA" panel at The Open Group conference -- Tony Baer, Beth Gold-Bernstein and Eric Knorr -- for their excellent contributions. 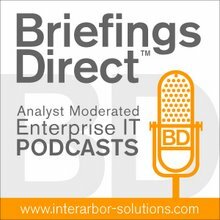 We'll make the discussion available as a BriefingsDirect podcast and transcript. I'll blog on it here when it's up.